The Mark series of amplifiers has been the jewel in Mesa/Boogie’s crown ever since its inception in the 70s. Starting with the Mark I and continuing until the present, these amplifiers are known for their vast sonic capabilities and their almost endless supply of creative mojo. This line of amps, in all its many incarnations, has not only been utilized to create the tones heard on many landmark records, it has been, in part, one of the creative forces to shape them. Listen to Carlos Santana’s singing and smooth lead tone from the MkI on his Abraxas record. Or delve into the MkIIC+ on Master of Puppets; a mighty sound that became the standard in defining the absolute fastest, tightest distorted guitar tone ever obtained by man. In it’s two latest incarnations, the Mark series amps have been the last word on tonal versatility and for this reason, it has mainly been championed as a studio player’s amp. No matter what session you’re working on, these were easy choices as go-to amps for their flexibility and quality of tone. At first glance, you will either become flustered and giddy like a schoolgirl, or immediately annoyed and unsure of yourself as a person. This is because the front panel of the MkV has no less than 35 controls…on the front! In comparison to most amps, this is insane and seems most unnecessary. Ahh, but the rewards of mastering these controls are sweet; if you are brave enough to travel through the labyrinth of knobs, switches and sliders there is a world of tone waiting to be discovered and, dare I say, created. Like most modern amplifiers, the layout of the MkV is divided into three channels, each covering a different tone range. 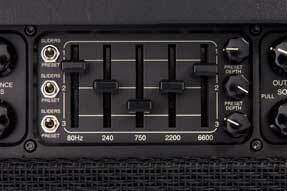 Typically, moving up each channel provides an increase in gain and tonal extremes, but that is the wrong way to look at this amp. Generally speaking this is true, but perhaps a better way to think about the three channels is more like tonal ballparks, each having their own unique range of gain. Each channel has three ‘modes’ that alter the impact of the basic controls (master volume, gain, presence, treble, mid & bass) over the sound; for example, within the same channel, increasing the bass in one mode may add punch and girth, but in another, result in a flabby, un-controlled tone. Also selectable by channel is the power rating (10, 45 or 90 watts per channel). Dropping the wattage can quickly overdrive the amp and yield some sweet and crunchy rock tones. This all goes, finally, to the graphic equalizer (if you don’t know what that is, look to your left), which lets you fine tune your sound by boosting/cutting select frequencies. Applying the classic V here yields the signature high-gain sounds of some of the most iconic rock music in history. If you don’t want to custom tailor the shape of the gEQ, you can set a preset amount of V to be used with a preset knob unique to each channel. All of this is footswitchable, of course. The back panel is mostly boring, so we’ll skip that. The only features back there worth mentioning are the Reverb control, which allows you to set different levels of shimmer and spank on each channel individually, and the effects loop, which allows you to insert effect pedals/processors before the amp’s power section. Next post, we’ll set sail on the sea of ROCK!!! !